My first "real job" was working for a machine vision guided robotics startup and ever since I've been hooked on robots. OK, there is a bit of boyish love of toys there as well but robots have a magical appeal I don't feel just writing software. 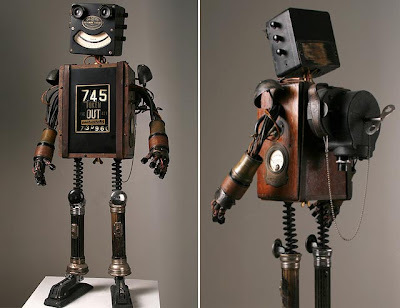 So it's not surprising that when I recently came across artist Mike Rivamonte's metal sculptures of robots and spacemen, I was mesmerized by every tiny detail. I'm normally not an art lover. That's my wife's strong suit and our home is beautifully decorated with her photos, artwork, and collectible finds. Not that I could afford one of these works but I think we could lose one vase for one of these bad boys. Doesn't everyone's home need a little retro techno cool?